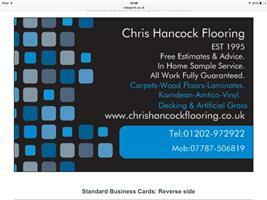 Chris Hancock Flooring - Carpets/Flooring, Landscaper based in Christchurch, Dorset. Having been involved in the flooring industry for 20 years, I have managed to build a wide range of knowledge and skills. My aim is to provide a friendly professional service, combined with building a good working relationship with my customers. I am fully insured, offering a free in home sample service, advice and solutions to any flooring issues. Due to the nature of our work we are not always able to answer all inquiries via mobile phone, however please feel free to leave an answerphone message and we will get back to you ASAP. Similarly, in respect to weekend phone calls, please leave an answerphone message, and we will return all calls on the following working day.